Since its founding, the Turkish Republic has endured its share of military intervention in politics, and seen four coups - two of them forced a change of government without taking over. They have all had grave consequences, and shattered many lives. But nothing compares to what we witnessed on the night of 15 July 2016. Were we expecting such a coup attempt? No. Even though there was talk of the mid-ranks of the military being unhappy with President Recep Tayyip Erdogan's illiberal policies, a coup was highly unlikely, many reckoned. Firstly, restraining the military's presence in politics was one of the governing AK party's main pledges, since its second term of office. In 2007, the then chief of the armed forces, Gen Yasar Buyukanit, opposed Abdullah Gul - an AKP founder and long-time comrade of Mr Erodgan's - becoming president. The AKP and parliament ignored Gen Buyukanit's intervention and elected Mr Gul anyway. But the general's attempt to shape government affairs suggested a conflict between the AKP and the military, and it increased support for the AKP. A month after Gen Buyukanit's intervention, the long-running and high-profile criminal investigation into Ergenekon began. Ergenekon, according to the indictment, was a terrorist organisation consisting of secular nationalists in the "deep state" - within the political system. They had allegedly plotted assassinations and bomb attacks to oust the government and had been influencing the Turkish political sphere for decades. Among those accused was a former armed forces chief, Gen Ilker Basbug. In 2010, another high profile case called Sledgehammer (Balyoz) started, which led to the incarceration of 300 army officials. They were accused of plotting a 2003 coup against the AKP government, but the majority of the evidence was found to have been fabricated. All defendants in both trials were acquitted. It is now acknowledged the trials were orchestrated by followers of Fethullah Gulen in the military, intelligence, police and judiciary. Gulen is an influential Islamic cleric who has been in exile in Pennsylvania since 1999. The AK party relied on the Gulen movement to eliminate the secularist establishment in the state and the military. The collapse of the trials sidelined the military, after which the AKP and the Gulen movement got into a power struggle for control of the state. The Gulen movement's presence in the state structure is deep-rooted and hard to trace. President Erdogan vowed to cleanse the country of what he called a "terrorist parallel state", carrying out arrests and waging a targeted campaign at certain points. But he has admitted that it is taking time. Still, Mr Erdogan seemed to be in control with top-ranking officials on his side. It looks as if the coup attempt of 15 July was staged mainly by the gendarmerie and air force personnel. 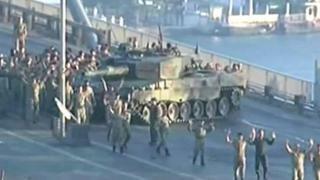 Key parts of the military fiercely condemned the coup attempt. The chief of the armed forces and two generals from the naval forces were reportedly taken hostage by the junta. The armed forces chief has reportedly been released, but the whereabouts of the naval generals is still unknown. There are several theories as to who was behind this failed coup attempt. Image caption President Erdogan (centre) has warned the coup-plotters will "pay a heavy price"
One theory suggests it was a "false flag" event staged by President Erdogan to gain more power, but common sense dictates the event went too far to be a false flag. Another theory embraced by the Kurdish movement is that Kemalists - secular followers of the founder of modern Turkey, Mustafa Kemal Ataturk - in the army tricked the Gulenists into staging a coup. They knew it would fail and that it would lead to a long-awaited cleansing of Gulenists from the military. 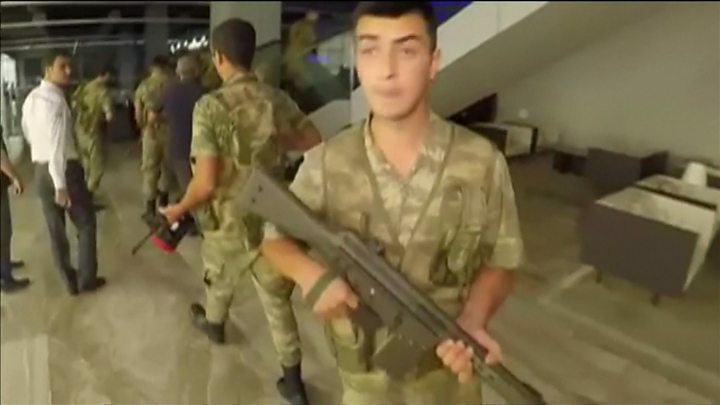 Another theory stems from a police source, who said that the AKP government had been planning to arrest Gulen-supporting army officials on 16 July. The source claims that when the coup-plotters learned about this, they went ahead and initiated the coup earlier than planned - hence the sloppiness. President Erdogan and his ministers blame the Gulen movement for the coup, and say that this attempt is the group's last gasp. He may be right, but there is a lot that does not add up. Firstly, using violence - let alone staging a coup - is not the Gulen movement's typical modus operandi. As we saw during the Ergenekon and Sledgehammer cases - and the collapse of the first peace process (Oslo talks) with the Kurds - the movement has resorted to methods like wire-tapping, fabricating evidence and smear campaigns. Secondly, the statement of the junta, that was forcefully read on the official government TV as the coup got under way, bore a strong resemblance to Mustafa Kemal Ataturk's famous address to the Turkish Youth. The coup plotters also called themselves the "Peace at Home Council", which is derived from Ataturk's famous saying "Peace At Home, Peace In the World". On the other hand, given that these references are too obvious, they may have been intentionally included to insinuate a Kemalist junta rather than a Gulenist one. The AKP government claims that a military prosecutor is behind the attempt, along with 46 officers whose names were leaked to media late at night. Nothing is certain for now, but a military coup would be the last thing Turkey needs while it is struggling with the spill-over of the Syrian War, the threat of the Islamic State group, and the Kurdish insurgency. 1997 - also known as "post-modern coup". Turkish military intervention leads to resignation of Islamist prime minister Necmettin Erbakan.